THIS WEEK’S OTHER FEATURED BOOKS, “CINNAMON GIRL,” BY LAWRENCE KESSENICH AND “UNASSISTED LIVING,” BY JIM GUSTAFSON, CAN BE FOUND BY SCROLLING DOWN BELOW THIS POST, OR BY CLICKING THE AUTHOR’S NAME ON OUR AUTHORS PAGE. THE BOOK: The Big Bang Symphony. THE AUTHOR: Lucy Jane Bledsoe. THE PUBLISHER: Terrace Books (trade imprint of the University of Wisconsin press). SUMMARY: Three women — a geologist, a composer and a galley worker — take jobs in Antarctica. As they each fall in love and into trouble, their lives become more and more entwined — until one crisis binds them in friendship for life. THE BACK STORY: I love writing about how extreme landscapes change people and whole communities. In this book, I especially wanted to write about the crazy beauty in Antarctica and how that affects the choices people make. Everyone writes about survival challenges on that southern continent; I wanted write about the emotional challenge. I got two National Science Foundation Fellowships to travel to Antarctica to research the novel and was lucky enough to get to spend time at all three American stations, including South Pole Station, and also in a field camp where scientists were studying penguins, climate change and cosmology. WHY THIS TITLE? One of my characters is writing a piece of music about the Big Bang. She is also trying to come to terms with an absent father who is an astrophysicist. The title points to my interest in finding the ways people connect with one another around their reach for beauty and meaning, on this planet and beyond. WHY WOULD SOMEONE WANT TO READ IT? Lots has been written about the history of Antarctica, but very little about the people living and working there. This is a people story, and specifically features three women on that wild continent. “In this compelling novel, Bledsoe captures the deadly beauty of the southernmost continent … a well-balanced humdinger of a story keeps this unusual novel hurtling along like a skidoo on the ice.” — Kirkus Reviews. “This is rich storytelling, full of gutsy characters, drama and transformation, reminding us of the awesome and ultimately untamable power of nature, and, as vulnerable, highly social animals, our place in it.” — Wisconsin Academy of Sciences, Arts and Letters. “Bledsoe skillfully orchestrates the lives of an intriguing set of characters gathered at an outpost in Antarctica … Bledsoe uses the locale’s incredible beauty and high potential for drama, danger and self-discovery for insights small and great as the women react to the sun’s breathtaking glint on the ice and, conversely, to the power of an unmerciful environment that so quickly turns deadly.” — Booklist. 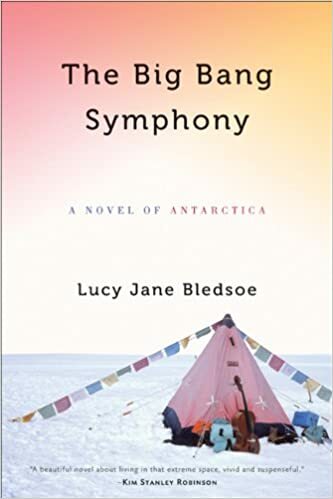 “For everyone mesmerized by Werner Herzog’s Antarctic documentary, Encounters at the End of the World, Lucy Jane Bledsoe’s rippingly good new novel, The Big Bang Symphony, provides a return trip into the minds of the scientists and misfits who choose to work in the extreme cold of the McMurdo Station … (Bledsoe) keeps things moving. She packs her book with lively, libidinous, oddball characters, the very most alluring and dangerous of which is the beautifully realized frozen landscape. Don’t miss this chance to feel like you’ve spent a seaaon there.” — Band of Thebes. AUTHOR PROFILE: Lucy Jane Bledsoe’s new novel, A Thin Bright Line, was just released. She’s the author of a collection of short stories, a collection of narrative nonfiction and four novels, including The Big Bang Symphony. 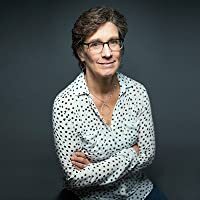 Her recent short story, “The We of Me,” published in The Rumpus, was chosen by ploughares Magazine as the best story published in lit mags that week. Her fiction has won a Yaddo Fellowship, the 2013 Saturday Evening Post Fiction Award, the Arts & Lertters Fiction Prize, the Sherwood Anderson Prize for Fiction, a Pushcart nomination, a California Arts Council Fellowship, an American Library Association Stonewall Award amd two National Science Foundation Artists and Writers Fellowships. Her stories have been translated into Japanese, Spanish, German, Dutch and Chinese. Lucy loves teaching workshops, cooking, traveling anywhere, basketball, doing anything outside and telling stories. She’s traveled to Antarctica three times, as a two-time recipient of the National Science Foundation’s Artists and Writers in Antarctica Fellowship and once as a guest on the Russian ship, the Akademik Sergey Vavilov. She is one of a tiny handful of people who have stayed at all three American styations in Antarctica. She has also stayed in a number of field camps, both on the coast and in the Transantarctic Mountains, where scientists are studying penguins, climate change, and the Big Bang. SAMPLE CHAPTER: See the Amazon page. LOCAL OUTLETS: I like to direct rteaders to their local independent bookstores. If you don’t know where one is, you can find a close one at IndieBound.org. Or order from Powell’s Books at http://www.powells.com. CONTACT THE AUTHOR: I can be reached, including e-mail, via my website: http://www.lucybledsoe.com. OR my Twitter account: @LucyBledsoe. OR my Facebook account: https://www.facebook.com/lucybledsoe.